I watched last night’s episode after a very long day, so I willed for it to end and couldn’t really give the ‘analysis’ my all. However, it certainly didn’t escape my attention that Belle Amie were dealt a really bad hand tonight. Venus? A song I can’t hear and not think of Gilette adverts? A song that the ever-memorable Girlband sang in the first week in the first slot of XF ’08 and subsequently landed in the bottom two, followed by their exit the next week? I’ll be very surprised if they escape the bottom two tonight. Other potentials include Paije (yes I’m going to drop his name again, no I don’t actually want him to go) and Aiden. If they want Aiden to stay, they should give him something other than the pseudo vampire image. Where the Frith did that come from, anyway? I’d namedrop some others that wouldn’t really surprise me, but that would defeat the point of predictions. Probably about time this game was actually playable, right?! I haven’t tried the second option yet (wireless mics), but I’m hoping to get some soon and I believe that they’re very good. Obviously, it means a lack of wires, which is always a bonus. The only way to have over 3 people singing at once is to fix it up so that there is a ‘dual display’ (that is, having both the computer screen and another TV/computer screen connected). I’ve never tried this, but if you know your stuff, setting this up won’t be too hard. For everyone else, this means that you need 1-3 microphones (probably best to buy 2 lots of 2 mics, that way you have a spare if one of them breaks!). I currently have only 1 USB connector, as one went missing. I therefore have it set up so that 2 SingStar mics are plugged into their USB connector, and 1 is plugged into the microphone slot in my laptop. As these are what I have at my disposal, I will demonstrate how to set up the microphones in this manner. However, I’m fairly sure the microphone input on the laptop is not quite as sensitive as the USB connector (poor player 3 is at a disadvantage!) – I would recommend using 2 USB connectors, with only 1 microphone plugged into 1 of them (into the blue slot), and 2 plugged into the other. So, you’ve got your microphones, and you’ve set them up as demonstrated (if you only have 1 or 2 microphones, this guide still applies). Before you go into UltraStar, you’ll need to edit the settings on Windows (sorry Apple fanboys, you’ll have to find instructions elsewhere). If you go to the Control Panel -> Hardware and Sound -> Manage audio devices, and click on the ‘Recording’ tab (or something to that effect if you’re not on Windows 7), you can test the microphones to see if they’re working. You’ll notice that the USB adaptor is listed, and its settings need to be configured separately to the default soundcard. For the USB connector with 2 microphones, you’ll need to tell the computer that the adaptor has a dual input, or else it’ll only recognise 1 microphone. Right click on the 2 USBMIC option, and click ‘properties,’ then select the ‘advanced’ tab. As shown above, select any one of the ‘2 channel’ options (preferably the highest quality setting if possible). Apply the other settings above, too, if they’re not in place already. 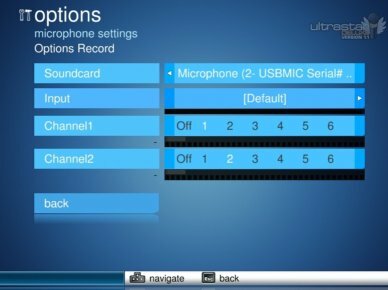 For a USB connector with 1 microphone, you can leave the settings as they are. Nothing needs doing to the default soundcard (i.e. 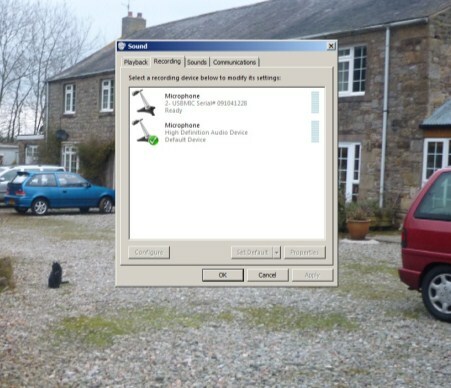 the microphone plugged into your laptop’s ‘normal’ input), though you might want to adjust the settings to make it as sensitive as possible. This way, player 3 will be at less of a disadvantage. You don’t want to go making the microphones plugged into the USB connector too sensitive, or they’ll pick up too much background noise. 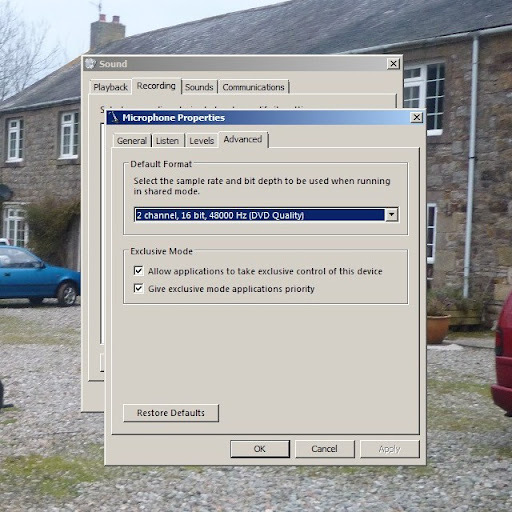 Once the microphones are set up in Windows, load UltraStar Deluxe. Once loaded, go into tools -> settings -> ‘record.’ At the top of this section, you’ll see one of the inputs listed at the top. This just means that you are altering the settings for one of the inputs (USB adaptor or default soundcard) – it does not mean that you can only use one input at a time. It does not matter what is left there when you exit the settings configuration. Use the left and right keys to select USB adaptor. If you have more than one USB adaptor, you can determine which is which by talking into the microphones (the program will respond to your voice). I hope this makes sense! If you want to sing with multiple players now (or just test it), you’ll need to configure the game settings to say you’re playing with more than 1 person. Press escape to exit the microphone settings, and go into ‘game’ (also under the settings menu). At this point, simply change the number of players to 3. Press escape twice to come out of settings, go to ‘sing,’ and test the microphones. Players 1 and 2 should correspond to the microphone colour. Player 3 will obviously be a blue or red microphone, though its colour onscreen is green. To avoid confusion, I dressed that mic with a green ribbon! This article isn’t finalised… I can imagine it’s extremely un-user friendly right now. In the meantime, have a play! It’s all laughs for now but hmm what about in a few weeks time!! I am wrong, and Paije survives the “bottom two” stigma for another week. On the plus side, I put a last minute bet on John to go and made a profit. I found Saturday night’s show the most enjoyable edition so far. The contestants were given some slightly less clichéd song choices – ironic, then, that these should be given to them in guilty pleasures week. I also now have a favourite contestant, along with every other straight female in the country. Paije – well, I thought he was almost guaranteed to be in the bottom two, and last night proved me wrong. It doesn’t matter how talented he is, though. They shook off John eventually and Paije is next on the list. Matt – Very enjoyable performance on Saturday and he was soon favourite to win again. Aiden – Popularity is evidently slipping, but I think he’s still one of the bosses’ favourites. He has that weird quality that repels women in real life but on a celebrity is attractive for some reason. When I say he has it, they’ve thrust it upon him. Mary – To keep her spot on the show interesting they need to throw something different at her. There’s usually no such thing as peaking too early, but evidently there is on this kind of show. In order to maximise her potential, they should’ve left the big belters for later. Then again, as soon as the audience sees her as a one tricky pony she’s easy to get rid of, and no one will be complaining to Ofcom. John – self-explanatory, but I hope the most talented person in the competition goes on to bigger and better things. ‘Blessing’ and ‘disguise’ spring to mind. Wagner – I’m happy for him to stay in, just to hear his name boomed out every week by Peter Dickson’s distinctive voice. Just how much longer he’ll be there, though, I don’t know – the novelty will wear off soon enough. Belle Amie – evidently, the ‘kicked puppy’ trick worked. Cher – no change there. Rebecca – after Saturday’s performance it’s evident, now, that she’s a Chosen One. Why not, anyway? Very sweet and very talented. TreyC – maybe people would vote for you if you didn’t spell your name that way. The Jungle Book is an overrated Disney film. It lacks magic and charm, and the only really good character is Baloo. However, it’s pretty funky and, obviously, contains good songs. “I wanna be like you” is the real stand-out of those songs. Why is it so good? Because it’s crazy. It finishes with Baloo and King Louie singing complete nonsense lines to one another, and it never fails to put a smile on my face. Those complete nonsense lines were improvised by Phil Harris and Louis Prima when they recorded it – an excellent touch. In Katie’s performance of it, it was trying to show her as a ‘different’ artist because she’s singing music from a children’s film and coolifying it. Wasn’t it so wonderful and quirky? I’m not saying she didn’t carry off the performance well, but it was a condensed version of the song to make people think ‘OMG the girl can do Disney, she MUST be good after all’ when she’d not been given the very resources that make that song what it is, and I very much doubt she even realises why that song is so good. I’ve also recently made this song into a duet version of the UltraStar Challenge Mod, I’d like to see her do that. Oh dear, I’ve become everything that I hate. The song is intact, no one has ruined it, and Katie is still not going to win. Chill out Kokairu. hes so ****ing rude to dannii, never talks 2 her, never ackowledges her unless its to be rude and i dont t hink dannii will be there next year. Options for the bottom 2 seem quite clear at the moment: it’ll be between Belle Amie, John and Paije. I’m going with the latter as a near definite – if not on tonight’s show, then sometime in the near future (if he’s lucky). I initially said of Paije, when he was picked as one of the wildcards, that “it’s all up to the producers whether they want to give him a real ‘belter’ just as his popularity starts to drop.” Therefore, though they have the resources to work with when it comes to Mr Richardson, they’ve chosen to neglect them, giving him the first slot of the night and a song choice that doesn’t reflect his strong vocal abilities that much. That’s not to mention that he lost his grandma this week and it was only briefly mentioned that it had been a difficult period for him. It’s not right to use situations like that to better the contestants’ progress, but it’s not as though the show’s shied away from doing it before, and if it had been given at least some coverage on the programme it would make Paije safe as a house. As for John, I say week on week that he’s not long for this show (and the bosses seem to be trying to shake him off like a bad case of ‘pins and needles’), but he continues to survive anyway. In a similar manner to Paije, he’s one of the most talented people there, but the producers just aren’t keen to maximise his potential. Belle Amie are somewhat of a question mark. They’ve got a shot at a rebound vote from last week, but their song choice was boring and their performance of it below average. The judges also didn’t offer any cues in their post-performance speeches that would make the audience want to vote for them, either. Saying that, their ‘kicked puppy’ look might have some impact. The only other possible contender, I think, is TreyC. Not because she was bad last night, but because she wasn’t given any stand-out cues to vote for her. She’s quietly liked, possibly being outshone by Rebecca. The remaining 9 contestants all have reasons to remain safe this week, most unfortunately that includes Katie. My keyboard could be spared if she goes tonight, because I have a number of problems with her song choice that only geek rage can express. There are a number of options on the above link. Though the current version of UltraStar isn’t actually final, it’s pretty damn awesome and much better than the older versions. It’s very stable and runs well. To obtain this version, click on the installation appropriate for your operating system, and download the installation file. The ChallengeMod is fantastic as well, but that’s for another time. 1) Sing – what it says on the tin. It will take you to your collection of songs, and you can browse through them using the left and right keys, pressing enter to make your selection. 2) Party – As I mentioned in my last entry, this takes the game to a whole new level when you’ve got a group of people playing, with various different modes including blind (the notes do not show), first to 5000 (the song ends when 1 player has achieved this), and ‘pass the mic’ (where the whole group gets involved). The game chooses which players from each team are going to sing on each round. It is typically played across 7 rounds; the team with the most points across the rounds is the overall winner. 3) Tools – this contains a MIDI file converter (more on this at another stage) and setup options. These will be necessary when you set up your microphones, and like most programs it offers options for changing the appearance and turning on/off certain features. I would recommend going into the ‘Sing’ option and selecting one of the sample songs as a starting point. There should be a couple of freebies in there. Even though your microphones won’t be set up yet, it gives you an idea of the gameplay. Use ‘escape’ to exit the song. 3) The song’s music video (most standard video formats are compatible with UltraStar, such as .avi, .flv, .wmv, .mp4). 4) An image to display in the background of the song while it is being played (this is an alternative option to having a video. If a video file is set to play, then the image will not be displayed). 5) A CD cover image of the song (or the album that it’s from). This will then be displayed when you flick through the songs on the selection screen. I won’t go into the latter 3 options at this stage (they’re not hard to add, but I’m trying to keep this as simple as possible). Instead, I will concentrate on the 2 files that you really need: a txt file and an mp3. 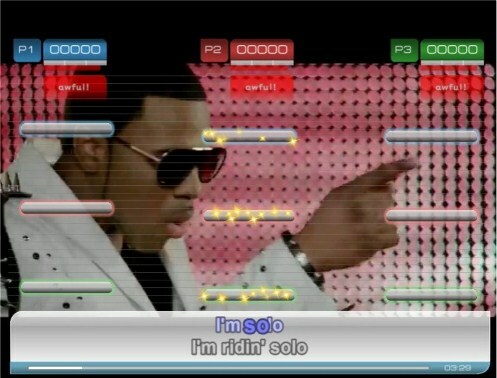 First of all, to really get started, you can easily obtain all the files you need for all songs that are on the existing SingStar games. In certain places. On these places, just search for UltraStar, and you’ll have a number of things to choose, including homemade packs and the aforementioned SingStar games. 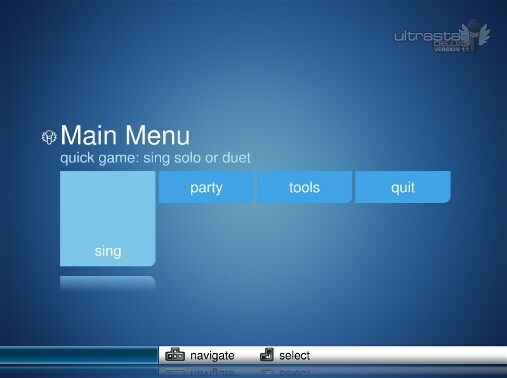 If that method’s not your cup of tea, but you already own some of the SingStar games, there are programs that will rip your games onto the computer for you, which you can find on the old UltraStar Deluxe Wiki. I’ve never tried these programs myself, and don’t know how up-to-date those links are, but presumably they’re straightforward enough. The following method of adding songs applies to anyone reading this. If the options above aren’t applicable to you, or you want to add some non-SingStar songs, follow the steps below. 1) In order to obtain a .txt file of a song, there are a number of websites you can use. By far the best one I’ve found is http://usdb.animux.de. You’ll need to sign up with an account first, but this is easy enough. Once you are able to login, you will have access to thousands of .txt files (NOTE: the mp3s are not available here, more on this in a second). Remember, .txt files only contain information about how to display the correct notes and lyrics at the correct time. 2) Select “browse songs” on the left hand side, and you can surf this site by artist, genre, or SingStar editions (these files are direct rips from SingStar using a program like the ones I’ve linked above). 3) Find and click on a song you like. To make this easier, though, try and find one that’s rated 5 stars. That’s not to say that anything less (or none at all) is a bad file, but it’ll make things easier to begin with. In bad text files, notes can be wrong and the lyrics may be out of time. 4) It’s also advisable to make this a song that you already own in mp3 format. Unfortunately, this is the only compatible audio format with UltraStar, so if you’ve downloaded it from iTunes, for example, you may need to download a program to convert it into mp3 format. 5) Click on ‘download text.’ This will then take around 30 seconds to load, unfortunately. As the site says, you can reduce this time by adding your own song files to the database. 6) When it’s loaded, save the .txt onto your computer (preferably in the folder in the UltraStar songs directory that you’ve already created, e.g. C:\UltraStar Deluxe\Songs\Cheryl Cole – Fight For This Love). 7) Find/obtain an mp3 of the song, and put this in the same folder. 9) The information at the top of the file is known as ‘tags.’ Each aspect, e.g. #ARTIST, #SONG, #EDITION, #MP3, #GENRE etc, is known as a ‘tag.’ The one that we are interested in at this point is #MP3. The filename next to the tag should be identical to the filename of your mp3. If it’s not already, then either change the tag to the filename of your mp3, or change the name of the mp3 to that listed in the tag. When you have done this, you have effectively ‘synchronised’ the .txt with the mp3. 10) Save the .txt, and load UltraStar Deluxe. If all goes to plan, when you go into the ‘Sing’ option, your new song will appear. If it doesn’t, retrace your steps and check the .txt file again. Does it have .mp3 on the end? This is essential. Is there a rogue space somewhere? It needs to match the filename exactly. 11) You may want to try playing the song now. Do the lyrics start at the right time and enlarge at exactly the right points? If so, then you’re very lucky. If not, then it’s to be expected. This is because not all mp3s are the same – some contain a significant amount of silence before the song starts (and others don’t), though you may not realise it. The person who made the .txt file will have been working with a different mp3 to the one that you own (or possibly the video version of the song, which tend to have longer introductions). 12) If you’re one of the lucky ones, and the lyrics of the song effectively pop up as Cheryl Cole is singing, then you don’t need to do any more at this stage. However, you’ll probably need the next bit of information, because the next song might not be as simple! 13) Press escape to exit the song, and again until you’re back at the song menu (where it’s showing a preview of the song, just before you select it to start singing). Instead of pressing enter, hit the letter ‘E’ on the keyboard. This brings up the built in song editor. 14) What you need to do, now, is adjust the #GAP tag on the song’s .txt file so that it allows the exact amount of time you need before the lyrics start, no more and no less. This can be achieved using this built-in song editor, on screen now. 15) The #GAP is a given amount of time in milliseconds before the very first note/syllable starts. For Cheryl Cole’s Fight For This Love, this allows for a brief instrumental introduction at the beginning (and for most songs, this is the case). 16) You’ll notice that the first line of the song is displayed, and the first syllable highlighted. Press the space bar. It will play a very brief snippet of the audio that is currently set to appear at that point. Is it before the syllable you want, or is it after? A general giveaway for this is whether it sounds instrumental (the song starts too early) or whether it is the singer’s voice (it starts too late). 17) If it is too early, you need to INCREASE the gap by pressing the ‘0’ (zero) key. If it is too late, then you need to DECREASE the gap by pressing the ‘9’ key. 18) You’ll see the #GAP tag on the above section starting to change. This may require some trial and error. As you alter the #GAP, press space every so often, and see what difference it’s made. 19) Remember that you are decreasing/increasing the #GAP a millisecond (1000th of a second) at a time, so you’ll need to press it a few times. If the song is drastically out of synch, then press ‘shift’ + either 9 or 0. This will change the #GAP a second at a time, but this may be too much of a jump if the song is only slightly out of synch. 20) In short, what you are looking for is for the first note to play the syllable at the start of the song, nothing more and nothing less. In this case, I want Cheryl Cole saying ‘Too,’ not a slight bit of music and ‘T-‘. It’s tedious, but once you get the hang of it, it’s straightforward. 21) If this note doesn’t give you much to go on and you’re finding it a struggle, you can try playing around with a different one. Navigate between notes using the left and right keys, and to different lines using the up and down keys. If the audio synchronises with the new syllable, it will synchronise with the rest. 22) Hopefully you’ll achieve this without too much hassle, and remember that once you get the hang of it, the process will be much quicker (I usually jump straight to this editor before I even play the song, after adding a new one). a. Have you managed to make the song synchronise with the text? If so, press ‘S’ to save the changes. It will not prompt you to do this, so it’s very important to remember! b. Have you made a complete mess of it and want to start over? Just press escape and exit without saving… no harm done! 24) Exit the editor by pressing escape. 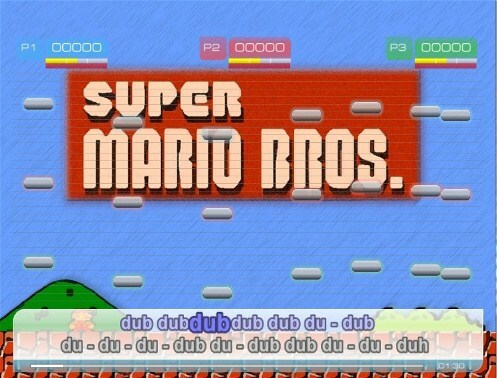 It will take you back to the song selection screen. Select the song you were working on, and hopefully it’ll display perfectly! a. A small number of .txt files have a set starting point as well as a #GAP. It’s difficult to explain this, but if you come across one of these .txts, you can put the #GAP in negative figures if necessary! You don’t need to worry about this for now, just remember that it’s a possibility. b. Don’t despair if you don’t have an mp3 of the song. In my forthcoming guide to adding video files, you won’t need to have the mp3s already, because you use the audio that is on the video file. Next up: how to set up the microphones! If you already know what UltraStar is, then there’s no real need to read the rest of this entry, which will serve as a general introduction. If you know what SingStar is, and hate the Playstation game to its very core, then this article may not be for you. If you don’t know what SingStar is, but hate karaoke, then go home and await a visit from the ghost of Christmas past. Or, perhaps, simply keep an open mind. Karaoke isn’t about singing. That’s a bi-product, as is the fact that the songs are invariably butchered. Primarily, it’s about having a good time with friends. The SingStar games for the Playstation 2 & 3, if you didn’t already know, take this aspect and turn it into a computer game, enhancing the experience with music videos, different modes of play, and scoring the players depending on how well they sing. It’s brilliant fun, but has its drawbacks. First of all, not everyone owns a PlayStation. This may sound presumptuous, but I’d say that love of karaoke tends to negatively correlate with love of the more serious ‘curtains drawn on a beautiful sunny day’ computer games. Granted, PlayStation 2s don’t cost much these days (and games like Buzz also make for great party antics), but the PlayStation 3 (now being marketed for its party gaming aspects) costs… well, a lot, to some people. That’s not to mention money for equipment and the games themselves. This brings me to my next point. The PlayStation 2 SingStar titles are somewhat limited. Only one game may be played at a time, and within that game, you have but a pool of 30 songs. Don’t get me wrong, I’ve had some great fun in the past, but it’s rapidly exhausted, and you’ll soon be wanting to buy another one to add some variety. Plus, within a given group of people, you’ll be lucky to pick up a game containing a songpool that caters for everyone. Switching between different games can work, but then the brilliant ‘party mode,’ in which the game is played in teams and carries on over several rounds, is not possible to play. SingStar for the PlayStation 3 works differently. Songs may be downloaded (at a price) and can all be used in the same songpool. This overcomes some major drawbacks with the PlayStation 2 experience: the limited number of songs, the limited variety of songs, and the inability to play with a massive selection of songs for party mode. I also understand that it has many new amazing features all round. However, that’s still a fair amount of money, plus more and more expense every time you want to add some songs. You also may be left waiting on that particular song you really want, which may not even be possible given disputes between Sony and the record label, or something. You’re limited to what they tell you is possible, and that’s that. Finally, to the point. 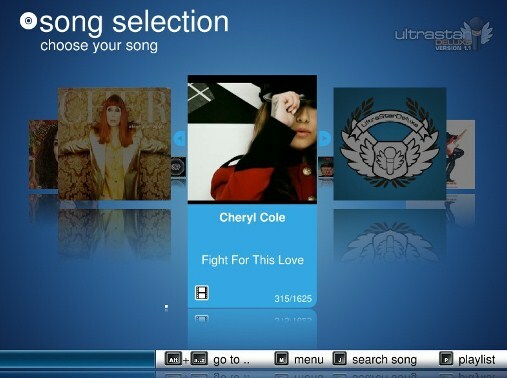 UltraStar is a piece of open-source PC software that simulates the format of SingStar. It’s not like the cheap imitations for the X-Box or the Wii, and it’s completely free. I discovered it about a year ago when I was going to buy a PlayStation 2 and a couple of the SingStar games to give my family something to do at Christmas. I stumbled across its Wikipedia article, and did a bit more research. Initially, it was a German game, and so many fansites are in Deutsch. As a result, I think it manages to stay under the radar somewhat. When I say it’s a German game, don’t let that put you off. It’s been translated into English, and the vast majority of the songs available are in English, as well as many of the websites (including the official one). The best part about this game is the sheer number of songs you can have in the songpool (I currently have about 1,500, and it could be so much more! ), so it matches the PS3 experience in that respect. What’s more, all songs available on the PS2 SingStar titles can be downloaded for it, in exactly the same format. Christmas with my family in 2009 was a blast. There is definitely something available for everyone. There are some drawbacks to this, however. First of all, not all the song files (written in .txt format… Notepad, that is) are perfect, and some are far from it (you can avoid such dud jobs, though, which I’ll explain at another time). Amateur versions of songs also need to be added carefully, and tied with an mp3 of that song and/or a video file. 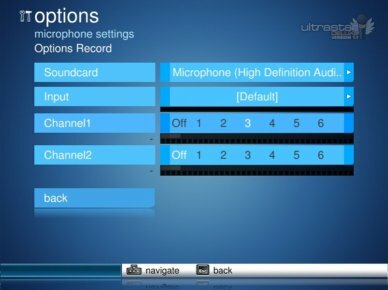 Using UltraStar therefore requires some patience, and lacks the ‘plug and play’ aspects of SingStar. However, once you get the hang of it, this part is very straightforward – I’m planning on doing extensive guides for this aspect, too, which might help. Adding the songs ripped directly from SingStar games is easy enough, too, so it’s still a great option – it depends on how far you want to go with it. For me, it’s become a hobby, but I really enjoy that sort of thing. I intend to use this blog to publicise updates for the UltraStar software and anything else noteworthy to report. I also plan to make various guides for more advanced users (such as how to create songs, though I’m definitely no expert in that respect). Firstly, however, I’d recommend downloading the software from the official site to get yourself started. Go on, have a play. It comes with songs already on it, so you may see how it works. I’m going to update with beginner guides on how to get started with the game over the next week. I have to admit, I’d heard rumours about the voting order when I updated yesterday. I’d originally outlined John and Storm to go, with Belle Amie to be saved on the judges’ vote. 2/3 isn’t bad, but the voting patterns never cease to amaze me. Admittedly, asking why Diva Fever went seems like a daft question, but the audience has always loved stupid acts like that in the past, and their performance on Saturday was fun, I suppose. I assume that Wagner will stay, now, being the main gimmick left, but who knows? Maybe people are basing their votes on talent after all. Mary – My stance hasn’t changed here, she’ll be in it till the end (or close enough). For two weeks in a row she’s had a ‘late’ slot, she’s a powerful singer, and they’re just generally painting her very favourably. John – he seems to have a fanbase now, so even if he is still a disposable, maybe he won’t go as soon as I’d thought. Wagner – see above. If people buy into the judges’ ‘reactions’ to his wild antics, we’ll see him on our screens for a good few weeks yet, I reckon. Storm – well, as I said, he was cursed from the word go. Simon just didn’t give him a hard enough time, now that Wagner’s on the scene, and they saw fit to give him the first slot of the programme. Poor bloke. On a side note, his song, “Born to Run,” was included on Peter Kay’s 2008 TV talent show parody, “… Britain’s Got the Pop Factor and Possibly a New Celebrity Jesus Christ Soapstar Superstar Strictly on Ice.” It featured Peter Kay as Geraldine McQueen on a motorbike. Seriously. Check out the first 60 seconds of the link. A parody of The X Factor shown 2 years ago is even more accurate of The X Factor today than it was initially, if that’s even possible. TreyC – I maintain that there’s no room for both her and Rebecca in this contest, and I heard that she may have narrowly escaped the bottom 3 last night. She’s the equivalent of a foreign pretentious film… critically acclaimed all round, but no box office smash. Ruth Lorenzo (XF ’08) also had this problem. Rebecca – she’s sweet, she’s Liverpudlian… but it’s either her or TreyC that’s up for the shock week 5 eviction, methinks. Cher – she has a fanbase and draws in headlines. I don’t think the X Factor Bosses, nor the voting public, will let her go just yet. Katie – this one’s interesting. I was right in predicting that she would get a rebound vote last night and safely avoid the bottom 3… but how much longer has she really got? She may be in trouble next weekend, if the rebound vote fades. Her main problem, I think, is that no female can relate to her. She’s too ambitious – quite likely, a fine quality to have in the recording industry – but not on this programme. We want to see complete nobodies, like ourselves, become somebodies. If we can relate to them, we can almost feel like the journey is happening to us. Personally, I can relate to Waissel as much as I can relate to a door stop. Aiden and Matt – both have significant followings and I wouldn’t put money on them going out before the final. Paije – I think he’ll go before the final 5, for reasons I outlined in my last entry. Belle Amie – My theory is that girls simply don’t like other girls – that is, unless they find them easy to relate to (see Katie). As a group, we can’t identify with all of them as a single entity, and the in-group bitchiness was really highlighted on Saturday. They have a great look and they’re pretty talented, but it doesn’t serve to counteract the former. There’s a small chance that they’ll get a rebound vote next week; if so, they’ll probably be out in week 4. One Direction – Nothing’s changed there. Diva Fever – apparently regular Butlins attendees don’t count for a significant portion of the voters. I enjoyed Saturday night’s show moreso than I did the first one. Might be to do with the fact that I watched it over at a friend’s house (with about 2 hours’ delay on Sky+, in order to efficiently fast forward the adverts).